Special Flooring Tampa Installation by Through the Woods Fine Wood Floors, Inc.
One our specialities is designing complete handcrafted stairways using hardwood to complement your architecture, suit your lifestyle and increase the value of your home. 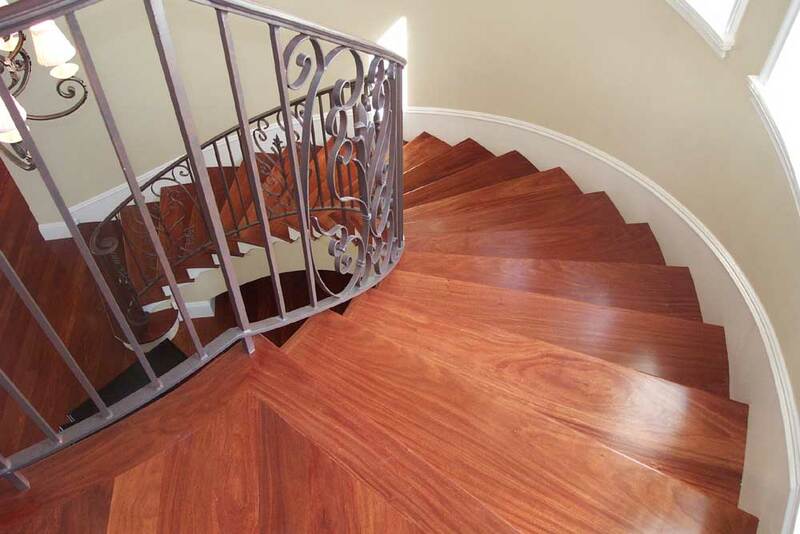 We also specialize in restoring and refinishing existing stairways. Borders create a frame in a particular room or area, contrasting to the main area of the room. Borders can dress up a room, define spaces and add an elegant touch. They can be a narrow, subtle accent, or wide, multi-species and bold. 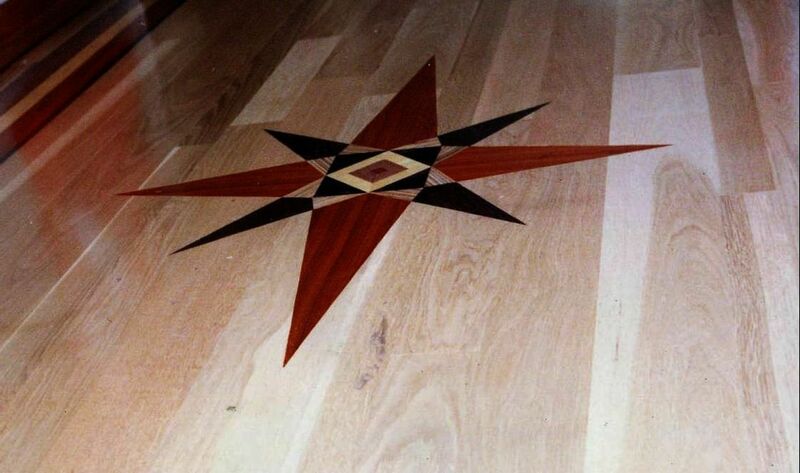 A floor of maple could be banded with Wenge or other dark woods, giving the area definition. The possibilities are endless, and are not limited to wood only. Borders can incorporate multiple wood species, stone, marble, and even metals. Medallions are available either pre-manufactured or custom-made at the job site, and add a unique look to any room. Usually are installed in the main field of the floor, often in areas such as foyers, they can incorporate multiple wood species, and other mixed media, such as stone and metal. Hand-distressing wood floors offers an antiqued appearance that appeals to many homeowners. Hand-scraping, which is labor-intensive and time-consuming, is the most-common distressing technique. Using tools such as chisels, planes, wire brushes, awls, ice picks and grinders, the installer will work with the wood to achieve a worn and distressed look. The end result will be a new floor that looks beautifully antiqued. We can create a stunning floor for you by mixing wood with other materials such as stone, tile, slate, marble, metal, and even leather. For example, highlighting a marble foyer with wood makes a dramatic entryway, while incorporating brushed nickel accents into your kitchen wood floor would accent your professional series appliances. Wood combines well with other natural materials to create a peaceful and relaxing ambiance. Combined with metal, it is an exciting 21st Century design element. We have sources for beautiful and amazing woods from around world. These woods are varying in color from yellow to pink to almost black with graining that resembles tiger stripes, lace or watered silk. Many of these woods are very strong and hard, much more durable than our home-grown domestics. We can completely change the look of your existing wood floor by sanding it and applying a stain of a different color or by removing the existing stain and leaving the wood unstained. A natural or light floor complements a contemporary theme, or a style such as Mid-Century Modern with its clean, open lines. A lighter floor will brighten a dark room and also increase its visual size. Traditionally, warm, medium tone floors were common, and blend well with antiques. 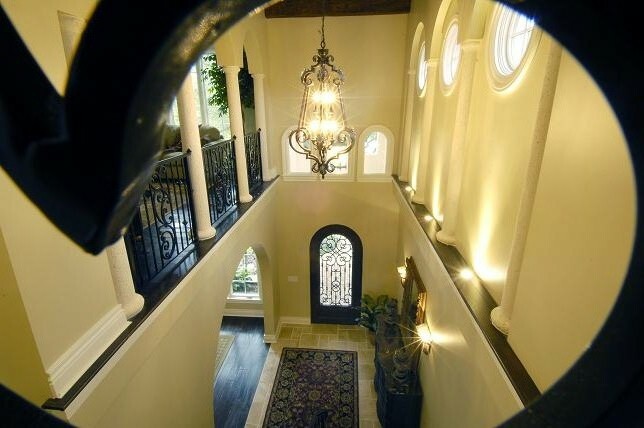 Dark floors impart a formal, elegant look and look great with many architectural styles such as Mediterranean Revival. Our craftsmen are masters when it comes of custom stains, including dyes which are applied in several steps and allow him to create a floor of nearly any color desired. For interior designer Eric Krause, he mixed a dark walnut dye which turned Eric's Seminole Heights bungalow's oak floor an exotic deep brown. We perfected this technique when creating an ebony floor for Sharon Stone's screening room. 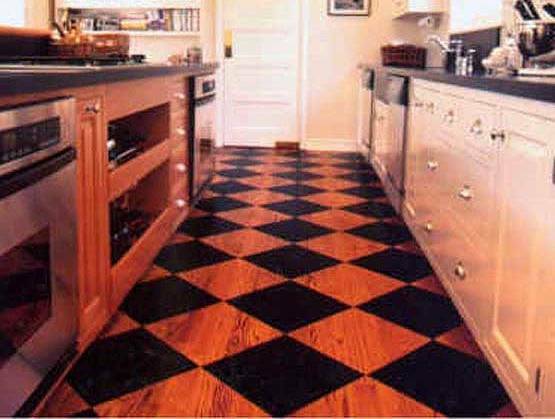 Let us help you choose a unique floor for your home!